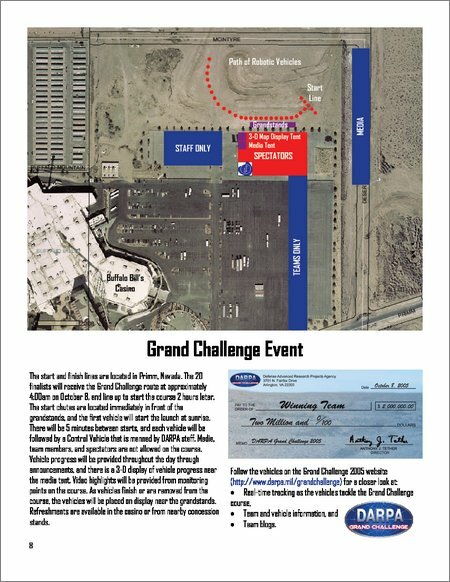 Today the Grand Challenge “National Qualifying Event” began, at the California Speedway in Fontana. The qualifying trials will last for the next seven days, after which the 20 teams that make it will travel to Primm, NV. Then on Saturday at about 4:00 AM DARPA will give the teams the GPS waypoints for this year's route, and at 6:30 AM the first vehicle will begin the race. One guy who was at the speedway today and saw a few of the trial runs said “ Not only are we going to have a winner on the GC, but I predict many vehicles will finish.” Maybe I'll drive to Fontana tomorrow. DARPA has a nice brochure (1 MB PDF) with annotated satellite images and everything. The grandchallenge.org site has what looks like a new RSS feed aggregating GC team weblogs. Did you go to Fontana this week-end ? What's your assessement ? No, I didn't make it out there. But I'll be heading to Primm on Friday.